About fifteen members gathered in the Cafe of the Westbank Centre for lunch before our visit and learned our first thing about the Centre – anyone can come to the cafe and purchase a hot or cold lunch that is very good value for money. When we had all gathered together, Lucy de Garis from the Westbank Centre, showed us around. As we were going around, Lucy explained that the centre had a mixture of staff and volunteers together with a Board of Non-executive Directors: Westbank Staff were responsible for various parts and projects within the Centre together with over 600 volunteers who helped in almost every activity, some of which are listed below. The walk around the centre started in a large, bright and airy space, used primarily for children’s activities, then along the corridor past the cafe and into the Gym and Fitness room. Here there were lots of equipment, supervised by qualified instructors and used by people recommended by doctors for post operation/illness recovery as well as by casual users. After the Gym we made our way to the balcony meeting room, used by the centre and outsiders, a room with plenty of space, tea and coffee making facilities and a wonderful view over Exminster and Exeter. Then on to the day care centre where elderly men and women come to spend some time, be entertained and cared for by the staff. When we were there, a small group entertained us and all in the room with a song that (some of us) joined in. 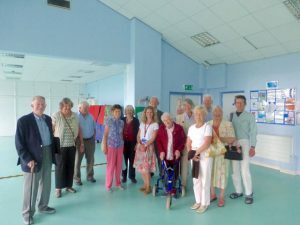 To finish the visit, Mary Nisbett, the Chief Executive of Westbank, talked to us about the history of the Westbank – how it started as a group of Friends of Starcross doctors practice, how it has grown over the years to its present size, occupying two connected buildings and having a budget of some millions of pounds. We were all impressed by the range of activities, mostly local but some national, covered by the Westbank; we were all impressed by the facilities offered to clients and outsiders who were able to come to the centre and improve their wellbeing, fitness, etc. Some of the activities of the Westbank are listed below – covering a most impressive range for all ages from children to the elderly. The group photo at Westbank! Westbank offers Hospitality Services for Conferences, Meetings etc, with refreshments as needed, all at competitive prices. 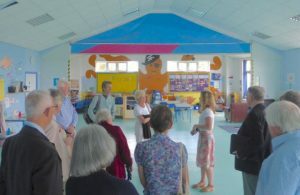 This was an excellent visit, much enjoyed by all who took part and our thanks go to Lucy de Garis and Mary Nisbett who looked after us so well.